A Nigerian dad Usman Shamaki was able to save the life of his neighbour’s daughter after he trusted his guts and applied in the nick of time a lesson his father taught him 21 years ago. Life is precious and to be a tool in preserving it is a truly amazing experience, but preserving life or rescuing another from the throes of death requires quick-thinking, swift but calm actions. Failure to be proactive has led to the death of many, while in more advanced countries, where basic practices have been used to protect the sanctity of human and indeed animal live; loved ones at the brink of death have lived with their families longer. The act of administering cardiopulmonary resuscitation (CPR) is a basic skill that every one ought to learn, practice, and teach to others because of how it can come as a timely intervention and last hope for someone hanging in the balance of life and death. 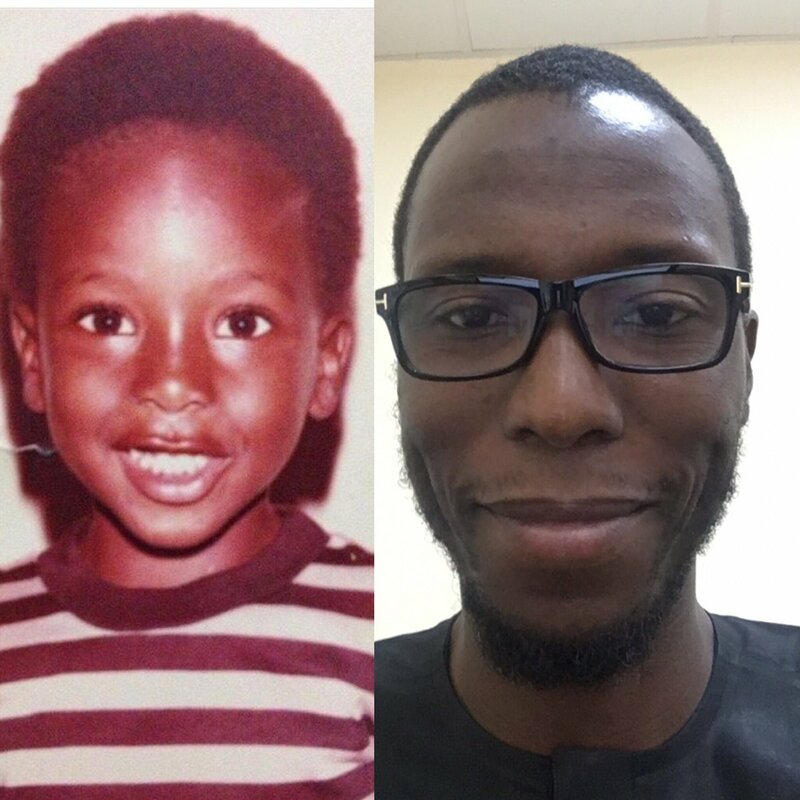 21 years ago when his father taught him about applying emergency chest compressions, Twitter user and dad Usman Shamaki had no idea under which circumstance that lesson would be applied or indeed if it would work. Nonetheless, despite not trusting his guts, he laid his panicky neighbour’s limp and near lifeless child on the ground and started to perform a CPR. 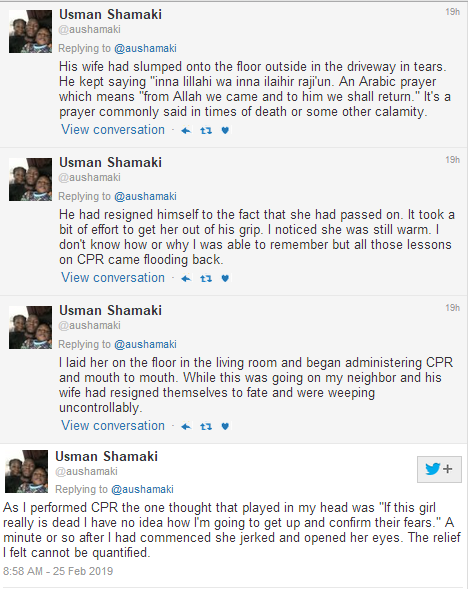 Although the child’s parents had given up hope as they truly believed she was dead, Usman who is himself a father-of-two noticed that despite her limp body and ceased breathing, the child was still a little warm, he struggled to take the child from the distraught father and gave CPR as his father had taught him years ago. 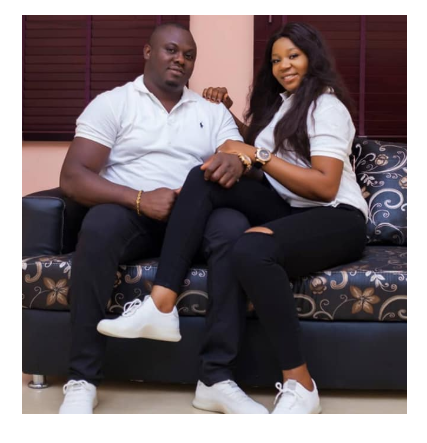 His quick intervention paid off and in a minute, the child jerked and opened her eyes, and the selfless Shamaki in the company of his wife hurriedly drove the resuscitated child to the hospital. On and on we went till he made sure I had memorized and gotten all the steps right. 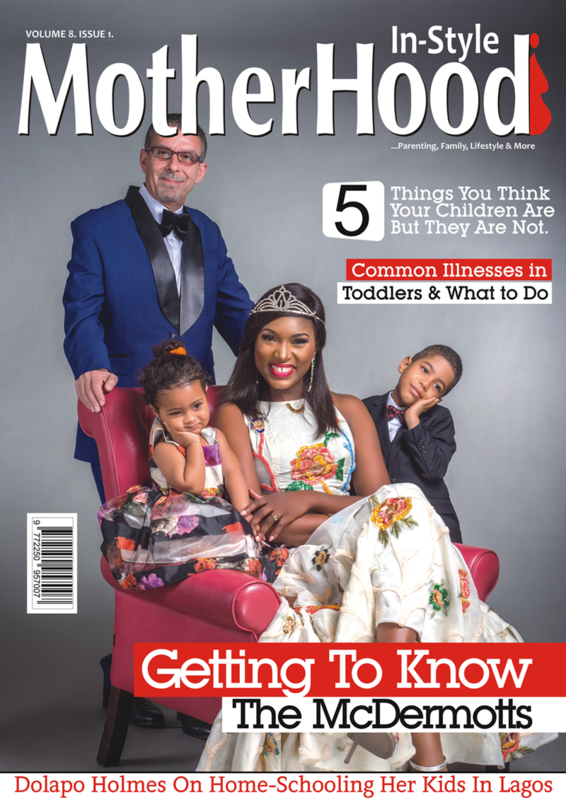 When we were done I dusted my hands and went back to my usual routine (whatever that was) thinking I would never need the knowledge…till last week. On Monday 18th February, my neighbor knocked on the door at about 9:24pm holding the limp and lifeless body of his daughter. She had suffered a seizure brought on by a sudden fever and had lost consciousness. He was totally devastated and couldn’t speak coherently. His wife had slumped onto the floor outside in the driveway in tears. He kept saying “inna lillahi wa inna ilaihir raji’un. An Arabic prayer which means “from Allah we came and to him we shall return.” It’s a prayer commonly said in times of death or some other calamity. He had resigned himself to the fact that she had passed on. It took a bit of effort to get her out of his grip. I noticed she was still warm. I don’t know how or why I was able to remember but all those lessons on CPR came flooding back. I laid her on the floor in the living room and began administering CPR and mouth to mouth. While this was going on my neighbor and his wife had resigned themselves to fate and were weeping uncontrollably. As I performed CPR the one thought that played in my head was “If this girl really is dead I have no idea how I’m going to get up and confirm their fears.” A minute or so after I had commenced she jerked and opened her eyes. The relief I felt cannot be quantified. Maman Aneesa and I bolted out of the house barefoot and drove at breakneck speed to a nearby hospital. We left my neighbor and his wife behind cos they hadn’t composed themselves enough to be able to come along. By the time they arrived she had been stabilized. About an hour after the entire ordeal the shock of the situation got to me as my hands got shaky and all the what ifs began swirling in my head. 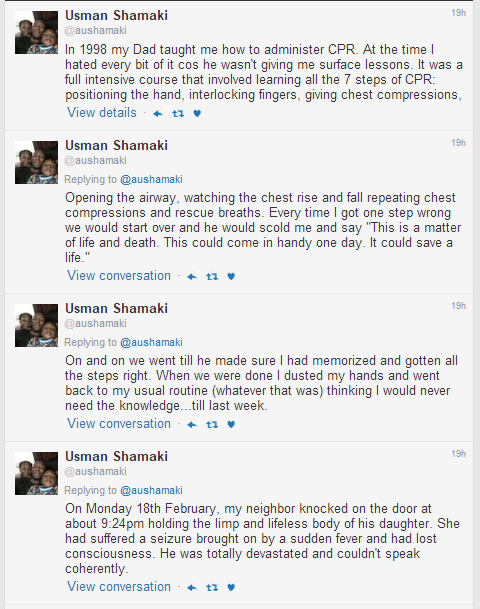 The moral here is that parents, and everyone should learn everything about the basic skill of giving CPR so that life can be saved just as Shamaki saved the life of his neighbour’s child because the preservation of life is a collective responsibility. We must learn to wail less, and approach situations with practical solutions, armed with the skills to solve problems. Kudos to Shamaki.